Whilst the last members were signing it Doctr. FRANKLIN looking towards the Presidents Chair, at the back of which a rising sun happened to be painted, observed to a few members near him, that Painters had found it difficult to distinguish in their art a rising from a setting sun. I have said he, often and often in the course of the Session, and the vicisitudes of my hopes and fears as to its issue, looked at that behind the President without being able to tell whether it was rising or setting: But now at length I have the happiness to know that it is a rising and not a setting Sun. In 1786, Massachusetts farmers attacked courthouses to protest foreclosures on their properties, and in January of the next year attempted to seize weapons stored in an armory. The civil and economic unrest known as Shays' Rebellion provided further support to those who had been calling for a stronger national government than that which had been formed under the Articles of Confederation adopted in 1781. The Articles guaranteed the independence of the states and did not provide for a federal chief executive or judicial system, giving the Continental Congress little authority to deal with emergencies such as the armed revolt led by Shays or the underlying problems provoking the revolt, including skyrocketing inflation, the lack of a recognized national currency or system to manage trade between the states or foreign countries. Even prior to the Massachusetts uprising, a meeting in 1785 initially convened in Alexandria, Virginia, and then continued at the Mount Vernon estate of George Washington, discussed possible steps to strengthen the national government. In the Virginia assembly, a proposal offered by James Madison and John Tyler that the Continental Congress be given power to regulate commerce throughout the Confederation led to another meeting, the Annapolis Convention convened in Maryland where representatives from several states discussed commercial problems. When the delegates at this meeting began to address governmental reform issues that they believed went beyond the authority given them by their respective legislatures, Madison and Alexander Hamilton, a young lawyer from New York who had served as an aide to Washington in the Revolution, drafted a report summarizing the discussions in Annapolis and calling upon Congress to summon delegates of all of the states to meet for the purpose of revising the Articles of Confederation. The report was widely viewed as an interference with the authority of the Congress, but the Congress put aside the challenge to its jurisdiction to approve a formal call to the states for a convention to meet in Philadelphia. The Convention convened in the State House (now Independence Hall) in Philadelphia on May 14, 1787, but did not formally meet for business until May 25, when a quorum of delegates from seven states had arrived. Washington was elected unanimously as president of the Convention. When a resolution introduced by William Paterson of New Jersey simply to revise the Articles to give Congress more power to raise revenues and regulate commerce failed to gain a majority, the larger states moved to abandon attempts to amend the Articles in favor of the drafting of an entirely new document. The delegates debated the articles of the new Constitution through the summer and into September. Although their sessions were closed, a record of the positions advanced and the votes taken on each resolution is available through the extensive notes taken by some in attendance, principally James Madison, who is generally credited as having the most significant role in the drafting of the final document. Chief issues debated during the sessions included how much power to allow the central government, how many representatives in Congress to allow each state, and how these representatives should be elected--directly by the people or indirectly by the state legislatures. The Virginia Plan advanced by the larger states proposed to base representation on population; the contrasting New Jersey Plan called for a legislature of equal representation for each state regardless of its number of people. The ultimate compromise--creation of a Senate with two members from each state elected by the individual state legislatures and a House of Representatives with its composition apportioned by size of population and elected directly by the people--bridged the differences between the interests of the larger and smaller states. 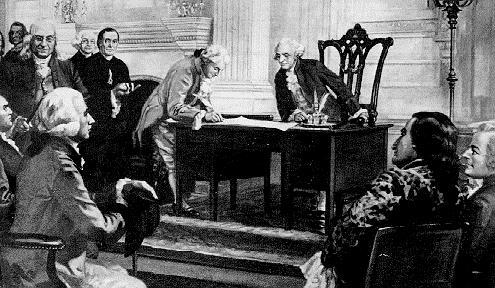 The document signed on September 17 was then submitted to the Congress, which in turn on September 28, 1787 approved a resolution directing that it be provided to each of the state legislatures to vote on its ratification. After the Philadelphia Convention adjourned, several of the delegates returned to their respective states to urge support for the document's ratification. The Federalist Papers, a series of 85 essays published anonymously under the pen name "Publius," between October 1787 and May 1788, primarily appearing in two New York state newspapers of the time, The New York Packet and The Independent Journal, were the most prominent effort of those seeking approval of the new charter. They were written to urge citizens of New York to support ratification of the proposed Constitution, and while their authorship remains uncertain to this day, they are thought by most historians to have been the work primarily of Alexander Hamilton, John Jay and James Madison. On June 21, 1788, with the ratification by New Hampshire, the nine states required to approve the Constitution pursuant to its Article VII had acted, making it effective.